NEWS: Emirates has made some sharp changes its Skywards programme, making redemptions a lot harder, and reducing lounge access for Golds. It has also axed a number of partners, such as SriLankan Airlines. 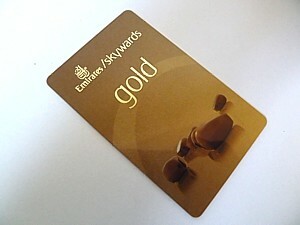 Skywards is Emirates' frequent flier programme. It is part of no global alliance, however it is possible to earn and redeem points from some other airlines (alas, not as many as you once could). Joining is easy; it's possible to do it online. 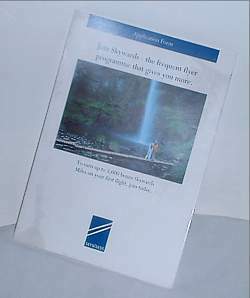 Alternatively all the planes also carry a 6 page brochure on board which contains a temporary card. Alas, the old joining bonuses of 2.5k (3.5k in Business) have got the chop. You only earn tier miles (to get to Silver or Gold status) on Emirates flights. Your tier level used to reset at the end of each calendar year, but now your tier status will be reviewed at the end of the same month in which you first earned it. Emirates Skywards has a pretty standard earning system, but have recently made it a whole load more complicated. You earn one mile for each mile flown on Emirates Airlines, however this is multiplied by the type of fare and the class of cabin. Quite simply, more expensive tickets earn more miles. There were howls of anguish in the Frequent Flyer community when Emirates deemed that Saver fares (in effect almost all economy fares) would only earn 50% of the base Miles. Add to this First only earning 1.5 times miles (as opposed to three times miles) and Skywards is a whole lot less generous that it used to be. In terms of miles, London to Dubai is 3414 miles, and from there to Singapore is 3629, to Perth 5616, to Sydney 7580, and to Auckland 8827. Skywards also allows you to collect miles from some other airlines, although it is a lot less generous that it once was (in the olden days when you could collect Oneworld, StarAlliance, and even Skyteam flights allowing you to collect miles from British Airways (and its codeshares, like Qantas) and redeem them for Singapore Airlines tickets (plus it's codeshares, like bmi). Ah, the good old days. Continental Airlines & United Airlines, Delta, Malaysian airlines, Korean Air, and Virgin Australia are all no longer partners. Even Sri Lankan airlines have gone, following the blazing row between the two. Now you can only earn miles Emirates Skywards miles with Japan Airlines, Jet Airways, Kingfisher Airlines, Korean Air, and South African Airways. However, if the list of airlines that are partners seems Spartan, the list of hotels is very extensive, and includes all the usual Accor, Hilton, Hyatt, Le Meridien, Marriott, Shangri-La, Starwoods & Swissotel chains. Redemption levels at Emirates are slightly lower than the equivalent Star Alliance redemption rates for economy, but significantly higher if you want to travel in the premium seats. However Emirates try hard to avoid telling you how many miles you need until you are well doing the booking process. They really make it as hard as possible to calculate the miles needed, with complicated calculators that in theory do the work for you. A simple grid would be better. There are two types of redemption tickets with Emirates, just as with tickets you pay for. Saver and Flex rewards. It can be hard to track down a saver award, but there are always plenty of Flex awards. Alas, they cost a lot more. To redeem miles with Emirates, you have to check which zone you are in. The UK and Europe are in in Zone 1. To fly from there to Dubai return (Zone 5) takes 45,000 miles, or 77,500 for a flex booking. (90,000 business, 135,000 first). Australian meanwhile has now been split into two zones, east and west. Dubai to Brisbane, Melbourne and Sydney (Zone 13) now come in at 72,500 miles in economy (125,000 in flex, 145,000 in business, and First at 217,500 miles). This is actually a sharp drop from the old level of 190k for business and 285k for first.). London to Sydney in First Flex comes in at a whopping 337,500 miles. New Zealand (Auckland and Christchurch) now have their own zones, and from Sydney come in at 25,000 for an economy return. You can also redeem flights with the partner airlines, however the redemption rate is so high, you should avoid this unless you really need to. You can use you Skywards miles for a one way upgrade to the next class of service, although the redemption rate is so high, you might as well put the points on a Star Alliance carrier and get a completely free flight for that level of redemption. The UK is in Zone 1. To upgrade from there to Dubai (Zone 5) takes 32,500 miles, Singapore is Zone 11 at 67,500, all of Australia (west) 80,000 miles ( an increase on 62,500 just last year). A simple one way upgrade over the Tasman to New Zealand on Emirates Skywards costs 16,000 to upgrade a class one way, one of the cheapest redemptions on the network. Blue level is where you start off. There are very few perks at this level; the only one really worth bothering about is that you can book your seat. Silver level can be achieved at 25,000 tier miles or 20 paid segments on Emirates Airlines in your membership year. Skywards Silver membership entitles you to business class check in, an extra 12kg of luggage, and you get access to a lounge in Dubai. Not a very good lounge. Indeed, a pretty poor lounge, but it is a lounge after all. There is also a 25% bonus for every mile you fly on Emirates. Alas, the perk of a reduced level to maintain this status has been removed. To renew your status as Silver, you still need 25,000 miles. Gold level can be achieved at 50,000 tier miles or 40 paid segments on Emirates Airlines in your membership year. Skywards Gold members are entitled to business class check in, 16kgs free excess baggage, access to all Emirates lounges (although you can no longer bring in a guest), and guaranteed reservations on fully booked flights. There is also a 50% bonus for every mile you fly on Emirates. Alas, Skywards falls flat too when it comes to re qualifying. Emirates Skywards does not have a soft landing for golds, and if you fail to get even 25,000 miles, you'll crash down to blue. 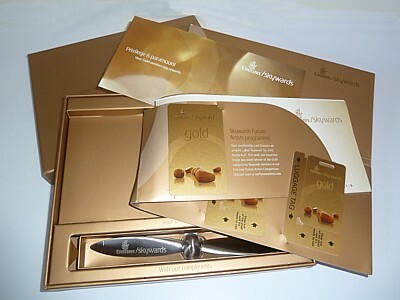 There is a great Gold membership pack for Gold level: it looks rather like a box of chocolates, and even includes an engraved letter opener, in the shape of a propellor.